Are they seeds? Legumes? Fruit? Well, in the culinary world, the answer is “yes” to all three! Although the botanical definition of a nut is quite defined, the culinary use of the word “nut” is rather varied. Almonds and walnuts are technically seeds, peanuts are really a legume, while hazelnuts are considered a true botanical nut. Botanically speaking, nuts are a composite of seed and dry fruit found inside of a hard outer shell. Most of what we consider nuts for culinary purposes share the same characteristics: oily, tender flesh surrounded by a hard outer shell. Nuts tend to be energy dense and provide a variety of vitamins and minerals. For these reasons, nuts have been a favorite among vegetarians and other health conscious individuals. Most nuts are high in Omega 3 fatty acids, which have been shown to lower LDL cholesterol and provide other cardioprotective properties. In addition to providing healthy fats, nuts also contain high amounts of fiber, protein, Vitamin E, and a variety of essential minerals. Raw nuts contain the highest amounts of these healthy nutrients. Roasting nuts reduces the antioxidant content and can reduce the amount of healthy fats. In addition, some roasting methods add other oils which may not contain the same health benefits as the oils found naturally in the nuts. Nuts are a common snack food and can be used as a vegetarian protein source. Because nuts are quite energy dense (or high in calories), they are a naturally compact source of energy, which is perfect for traveling. Nuts are often a major component in trail mixes and granola bars. The high protein content of nuts makes them a healthy substitute for animal protein sources. In addition, nuts contain healthy Omega 3 fats compared to the saturated fats that many animal protein sources contain. 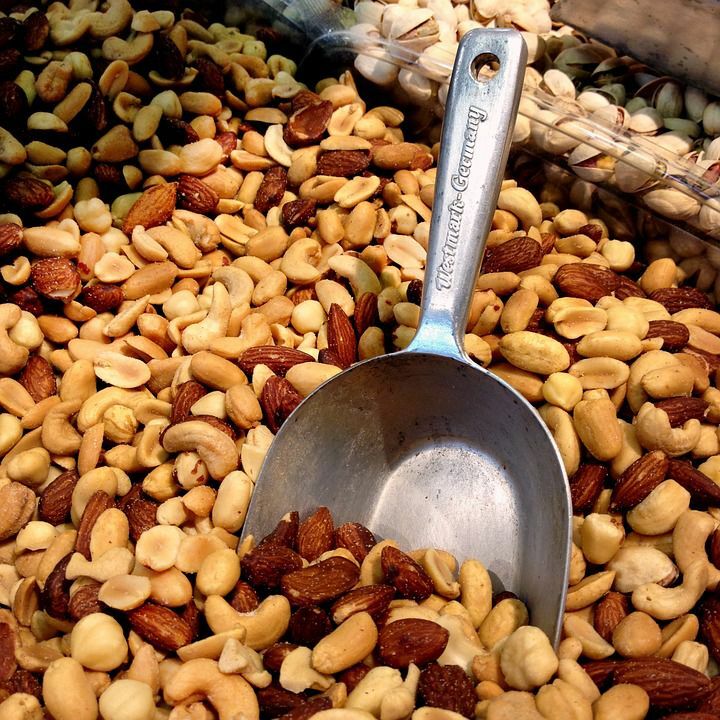 For this reason, nuts have become a favorite among vegetarians, vegans, and other health conscious individuals. In addition to being eaten whole, nuts are often pureed into “butters” and used as a spread or as an ingredient in dips. Some nuts, like almonds, are even used to produce non-dairy milk substitutes. The nuts are pureed, mixed with water, and then strained to remove the solids. The resulting liquid can be consumed plain or flavored and sweetened to increase palatability. Nuts can be purchased raw, in shell or pre-shelled. Whole nuts with shell intact are a popular item during the winter months and holiday season. Whole nuts can be stored at room temperature or refrigerated. Regardless of the storage temperature, nuts should be kept away from moisture and heat. Natural nut oils are delicate and can go rancid easily. If a nut has a bitter or off flavor, it should be discarded. Shelled nuts can be purchased raw or roasted. Roasted nuts have a deeper, more complex flavor and may also be salted or seasoned with other spices. Nuts can be either dry roasted or roasted in oil, both of which produce a unique flavor and texture in the nut. Shelled nuts also need to be stored away from heat and moisture. Freezing nuts is also an option and can dramatically increase their shelf life. A variety of nuts are made into butters or purees, most notably peanut and almond. Nut butters can be stored at room temperature if purchased in a sealed container but should be refrigerated once opened. Freshly ground nut butters should be stored in an air-tight container in the refrigerator.